On March 22nd, TÜV Rheinland presented the awards at the 2018 Solar Congress in Wuxi, China. 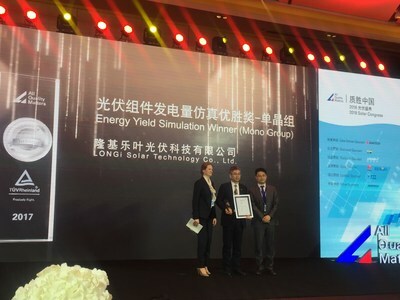 The highly coveted 2017 “PV Module Energy Yield Simulation Award” was conferred to LONGi Solar for the high efficiency and reliability of its mono-crystalline modules. TÜV Rheinland’s Energy Yield evaluation tests are extremely rigorous, requiring the simulations of climatic environments in five different regions worldwide – Cologne (Germany), Datong (China), Riyadh (Saudi Arabia), Chennai (India) and Los Angeles (USA). At its conclusion, LONGi Solar 60-cell mono module was named the best performing module and winner in the mono group. The “All Quality Matters” Award was established by TÜV Rheinland to be an objective and credible evaluation by an authoritative and neutral body to standardize product quality, establish a quality benchmark and guide sustainable development in the photovoltaic industry. The awards are recognized by industry experts, authorities, PV plant owners and manufacturers. This year’s awards were presented to companies with excellent performance and significant contributions in different aspects of the PV industry. With 18 years of experience and significant investments in mono R&D of more than CNY1.8 billion (approx. USD285 million) in the past five years, LONGi Solar now has a globally recognized advanced R&D capability with a team of almost 500 people, technical ability and a sophisticated quality control system. Building on these strengths, LONGi Solar will continue to focus on product quality and providing best in class LCOE solutions.